V.O.C. 's (Volatile Organic Compounds) are gasses and chemicals that are emitted in your home from objects and products like: paints, household cleaning chemicals, furniture etc. Carbon acts as a sponge to adsorb V.O.C.'s. The standard carbon blanket that comes with every Amaircare product is a very effective 'sponge', but with carbon, the more surface area there is, the more V.O.C. 's it can adsorb. So, the more carbon the better. Includes (3) Carbon Pre-filters & (1) 12 pound V.O.C. filter. This kit lasts for one year. Replace pre-filters every 4 months and V.O.C. filter yearly. 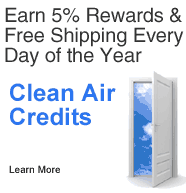 219 Clean Air Credits will be rewarded to you when you buy this item.